The Archbishop of Canterbury appeared to hit out at US President Donald Trump for the second time in a matter of weeks in his annual Christmas sermon. He told the congregation: ‘The nature of those who have power is to seek to hold on to it. ‘In 2017 we have seen around the world tyrannical leaders that enslave their peoples, populist leaders that deceive them, corrupt leaders that rob them, even simply democratic, well-intentioned leaders of many parties and countries who are normal, fallible human beings. ‘We have experienced across our country terrorism that kills the innocent, claiming that it is the path to freedom in God. Are authorities actually expecting Muslims to behave violently toward Christians? How dreadfully Islamophobic! Surely it ain’t so. After all, everyone knows it’s a Religion of Peace! Maybe officials in Egypt, Pakistan and Indonesia are expecting attacks from “right-wing extremists.” Oh wait, the “right-wing extremists” will all be inside the churches, since everyone knows that “right-wing extremists” are devout Christians. How terribly confusing it all is! The government has rented huge trucks with which they’ve created ‘barriers’ to prevent Muslims from driving into shoppers. Still think refugee programs were about helping people? They were and still are about destabilising our society and killing people. Thousands of shoppers who hit the city on Tuesday were faced with a confronting security measure, with Pitt Street Mall, George Street and Elizabeth Streets blocked off. Police say the rigs were placed in the recently-opened pedestrian shopping strip for “traffic management and security”, however Seven News understands they were there to discourage a mass-casualty terror attack. 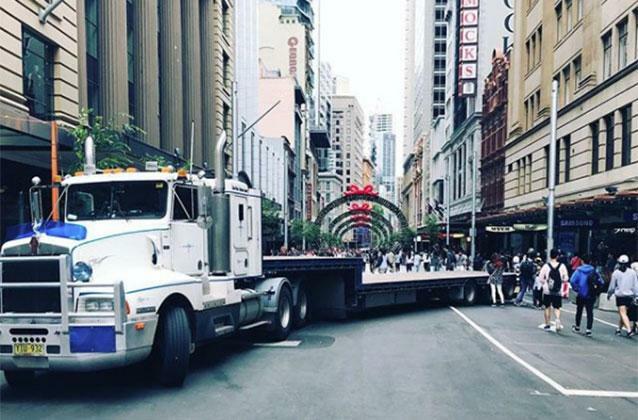 Semi trailers and concrete bollards blocked streets around Sydney’s CBD as a safeguard shoppers during the Boxing Day sales frenzy. Strange that Mohammedans commit these crimes wherever they go. A few days ago another Afghan tried to drown his German girlfriend and drowned himself in the process. Unfortunately, some do-gooders thought they had to save him so he can do it again…. Girl raped and burned alive by migrant. A 17-year-old girl from Pori, Finland, was raped and then burned alive by her boyfriend. The boyfriend, RaminAzimi, a migrant with a Middle Eastern background, refused his girlfriend’s wish to break up. Previous PostDIVERSITY BOLLARDSNext PostTell me again: how did Islam enrich our society? The Archbishop is just another example of incompetent, delusional, ignorant leadership in the Christian Church. So many. The bishop is seeking to hold onto his bishopric by enslaving his followers to please his masters. It seems like this bishop has been holding on far too long to his bishopprick. It’s done something to his mind.